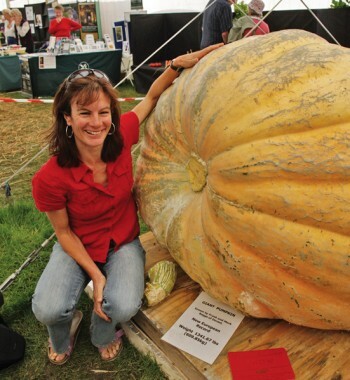 The Malvern Autumn show was a giant success, writes Hannah Genders. Having heard that the Malvern Autumn Show was all about “grow your own” this year, I decided to pay a visit. Although the show has been going for 14 years, this is only the second time the organisers have included show gardens – and the show gardens must be “edible”. The planting content must be 75 per cent edible for them to qualify, and there were some lovely little gardens displayed. These gardens were located in a feature called “plot to pot”, with a cookery stage in the middle of the marquee for celebrity chefs and gardening personalities to demonstrate how to cook the produce on offer. The day I was there, the new Gardeners’ World presenter Toby Buckland was on stage with Peter Osbourne – “The Big Chef”. The seated audience were being shown how to grow and cook all different types of chillies and the feature was proving to be so popular that the organisers are thinking of expanding it next year. Around the edge of the same marquee is where the edible gardens were laid out, and three of them particularly caught my eye. The first was a modern take on a potager, called ‘The Bradstone Bacchus Garden’, and was designed by Lindsay Anglin – she may be known to many of you as the winner of The Chris Beardshaw Mentoring Scholarship, which was featured on Gardeners’ World in May. Lindsay had moved into garden design from a career in account management. This is only her second show garden; her first one, which won her the scholarship, was presented at the Spring Show at Malvern earlier this year. She won a well deserved gold medal for this exhibit and is now planning her first garden at Chelsea. The central feature was curved steel borders planted with mixed thymes. Large cabbage, kale and broccoli plants created the structure around the curved path and white screens semi-enclosed the garden as you walked around it. The prize for enthusiasm should have gone to the children of Longlevens Junior School in Gloucester. Their little garden, called “Dig for the past… Plant for the future”, was a delight and they were so keen to tell visitors all about it. The design had been put together by members of the school gardening club, which they proudly told me had more than 200 children in it. They had help building the beds, but all the planting was done by the children and they had even grown all the plants during their summer holidays. They were judged equally with the adults and received a bronze medal for their special garden. The third garden, which had been at the Gardeners’ World Live show in June (so I had seen it before), was designed and built by Claire Potter. Claire had decided to enter this garden for the Malvern Autumn Show as it fitted the “edible” brief so well. Called “The Garden of Three Rs”, this garden was completely sustainable and contained lots of innovative ideas for recycling. It also had a wonderful plant called Schisho that I had never seen before, with deep maroon leaves, great texture and a taste like cinnamon when you chewed the leaves. Claire told me it was a bit tender but can easily be grown as an annual in most situations. This lovely garden received a silver medal. The Harvest Pavilion had a fantastic display of incredibly large vegetables; each one had its own class, from the longest bean to giant pumpkins that put my efforts to shame. I love this eccentric English phenomenon and even though they may not taste so good, vegetables displayed like this become a work of art. With vegetable growing high on the list at this show, even the RHS Floral Marquee had its displays of vegetables and fruit. The one display that stood out above all the rest was by Medwyn’s of Anglesey. Medwyn is well known to Chelsea-goers as he has consistently won gold medals for his exhibits over the last ten years. It was great to see him at the Malvern show and he won the award for Best Exhibit in the whole show. It was easy to see why, but this sort of dedication takes time – Medwyn told me the stand had taken five people two and a half days to put together, and the cherry tomatoes alone used over 3,000 cocktail sticks! With all this expert advice on hand, displays to excite and edible gardens to inspire the visitors, I think this show will go from strength to strength.